Irish web hosting company Blacknight has announced it will sponsor ‘The Outing - 2016’, the fourth annual LGBT Matchmaking & Music Festival, held in Lisdoonvarna, County Clare. "Our message to the LGBT community is that everyone is entitled to a fun weekend in Clare! ", says CEO Michele Neylon. A chance to win tickets for 2 people, covering 3 nights B&B and entertainment. 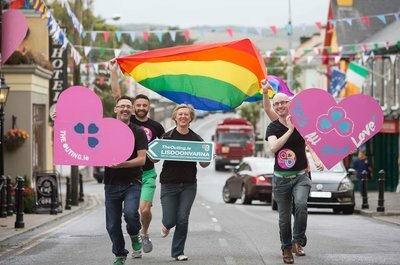 Blacknight, Ireland’s leading web hosting and domain names company, has announced it will sponsor ‘The Outing - 2016’, the fourth annual LGBT Matchmaking & Music Festival, held in Lisdoonvarna, County Clare. The Outing is the first event of its kind in the world: a festival of love in all its colours, drawing on old traditions, celebrating modern diversity: ‘A New Twist on Old Tradition’. “In the Spring a young man's fancy lightly turns to thoughts of love” wrote Tennyson, but of course he was thinking of the gentry. For ordinary country folk, love had to wait until the Autumn, when the harvest was done. A spa town on the fringe of the Burren National Park, Lisdoonvarna became famous in Ireland as the place to ‘make a match’. Today the annual Matchmaking Festival spans five weekends of music, entertainment and courting in September and October, attracting as many as 60,000 people from all over the world. Since 2013, the final weekend has been dedicated to the LGBT community, under the banner of The Outing. In Ireland, as elsewhere, the road to equality isn’t always smooth, but in May 2015, the Irish people gave a resounding ‘Yes’ to marriage equality, in the world’s first constitutional referendum on the matter. Homegrown hosting company Blacknight (blacknight.com) viewed it as a simple human rights issue, and company CEO Michele Neylon called publicly for a Yes vote, in a blog post on the company website. "This is a festival like no other in the world and, like we say here in Ireland, we are the land of Love & Equality. Having a home-grown company like Blacknight as our festival partner and web host is a marriage made in Ireland". To celebrate Blacknight’s sponsorship of The Outing, the company is giving away a pair of weekend tickets for the event, covering 3 nights B&B for two people sharing, as well as access to all the entertainment on the 7th, 8th and 9th of October. Well known personalities like Panti and Brendan Courtney will host the events on the main stage, and Noughties girl band B*Witched will headline the musical acts ranging from Irish traditional to cabaret. Art exhibitions and films add to the mix, and fourth-generation matchmaker Willie Daly will be on hand to put his unique talents to work on the important business of finding love. The Outing promises to be a fun weekend away in a special part of Ireland. You don’t have to be single to enjoy it - you don’t even have to be gay! To be in with a chance to win, just mention @Blacknight and #TheOuting in a post on Facebook or Twitter, explaining why you want to be there, and include this link: TheOuting.LGBT. The competition closes at 6pm (Irish time), on Wednesday 31 August. Winners will be announced immediately. Blacknight staff will conduct a draw among valid entries and their decision is final.